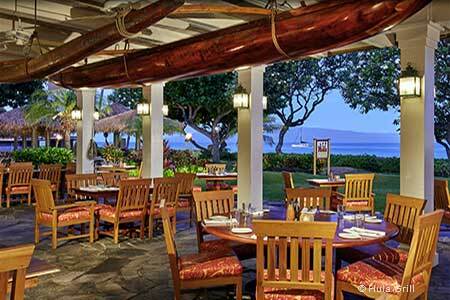 Hits the right notes with its casual regional fare and old-style Hawaiian beach house ambience. : Hula Grill has a perfect location, right on Dig Me Beach, in the middle of the Kaanapali Resort. The restaurant looks like what you come to Hawaii for --- an old-style Hawaiian beach house with antique memorabilia, koa canoes and outdoor dining. Here the notion is that you can have a nice piece of fresh fish, a decent glass of wine or beer and not pay too much. Behind the kitchen is Hawaii Regional cuisine chef Peter Merriman, who has come up with a simple but tasty menu. We recommend the wok-charred ahi served with citrus ponzu and kiawe-grilled ono with pineapple salsa. Another good option is to sit outside at the Barefoot Bar, dig your toes in the sand, eat a fish taco and sip a chilled Kona-brewed beer. The wine list has lots of moderate alcohol and unusual wines at reasonable prices. Service can be spotty, but this is such a pleasant place, you may not notice, especially if you go at sunset.